I first saw this cake arrive in my inbox many months ago from America's Test Kitchen/Cook's Country. Thinking how much my little one (and I) love mint chocolate chip, I saved it for a good occasion to give it a try. I confused matters with my usual routine of scaling cakes down to a more "manageable" size for my family of 3. 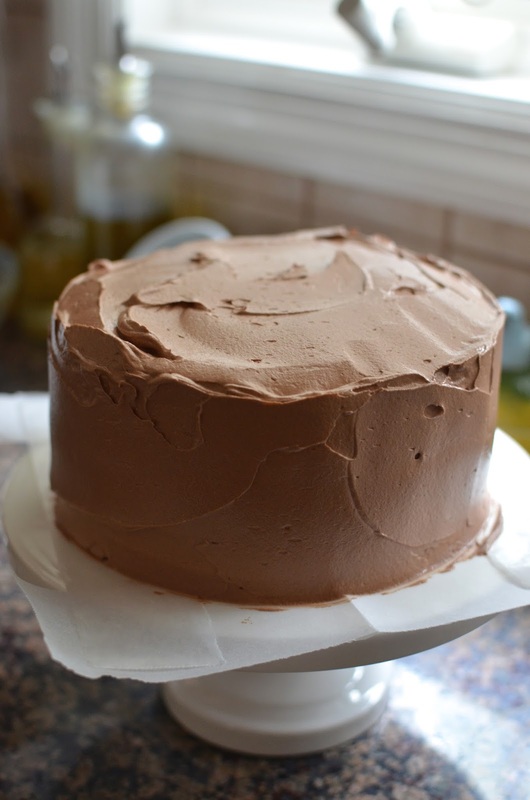 Instead of making a three-layer, 8-inch round cake, I divided the recipe in half and baked two 6-inch layers. So I sent the cake pans into the oven with fingers-crossed, hoping for the best. Luckily, after about 25 minutes, the cakes were baked and set. 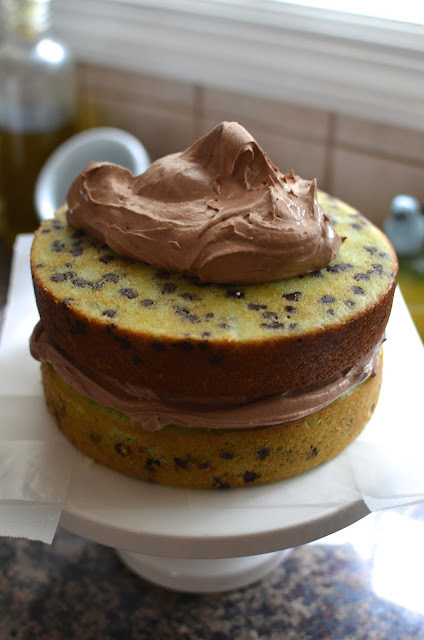 It seemed moist and tender and there were no issues other than the chocolate chips sinking to the bottom of the layers. I decided to invert the top layer and use the flat bottom as the top of my cake - that's why you see most of the chocolate chips at the top in that layer. I thought about forgoing the chocolate chips on the side of the cake but who was I kidding...more chocolate is always better! 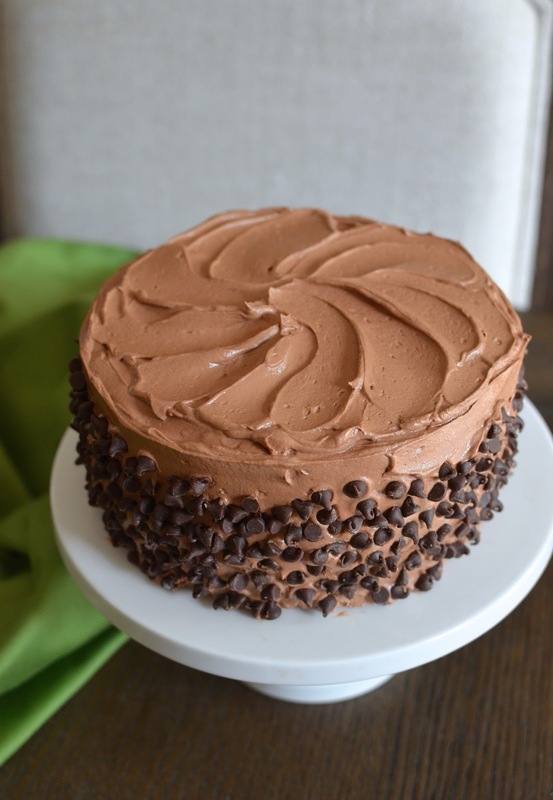 And honestly, someone needs to invent some sort of chocolate chip extruding device because putting the chocolate chips onto the sides of the cake without making a mess was difficult. Before long, I was essentially throwing the chips at the cake and hoping to make contact. I was a little nervous at the cake tasting moment...but the cake was light, moist, and fluffy. No doubt, it is mint chocolate chip (essentially, it is just that - minty and chocolaty) and in our house, that is a very good thing! One regret with making this cake is I'm left with 3 egg yolks. I simply don't have the time or energy right now to make a batch of ice cream with it so I think I'm actually just going to have to live with the waste this time. You just can't win 'em all! Make cake layers: Preheat oven to 350 degrees with a rack set in the middle position. Grease two 6-inch round cake pans, line the bottom with a round of parchment paper, grease the paper, and dust pans with flour, tapping out excess; alternatively, use baking spray. In a measuring cup, combine milk, egg whites, and vanilla extract, blending with a fork. Place flour, sugar, baking powder, and salt into the bowl of a stand mixer. Mix together on low speed. Add butter, continuing to mix on low speed until mixture looks like moist crumbs, without any white streaks. Add all but 1/4 cup of the milk mixture and beat at medium speed for about 1 1/2 minutes. Add the remainder of the milk mixture and beat for 30 seconds. Scrape the bottom and sides of the pan, then beat batter for another 20 seconds on high speed. Remove bowl from the stand mixer and stir in 1/2 cup of chocolate chips, the food coloring and peppermint extract. Divide batter evenly between the 2 prepared cake pans. Bake until a cake tester inserted into the center of the cake comes out clean, about 22-25 minutes. Remove cake pans from the oven, let cool a few minutes, then carefully remove the cakes from the pans. Remove the parchment paper and let cakes cool completely on a wire rack. Make frosting: Place butter, melted chocolate, vanilla, and salt into the bowl of a stand mixer fitted with the whisk attachment. Beat on medium-high speed until combined. Reduce speed to medium-low and gradually add confectioners' sugar and mix until smooth, about 1 minute. Scrape the bottom and sides of the bowl, as needed. Increase speed to medium-high and beat for about 3 minutes. The frosting should be smooth and fluffy. 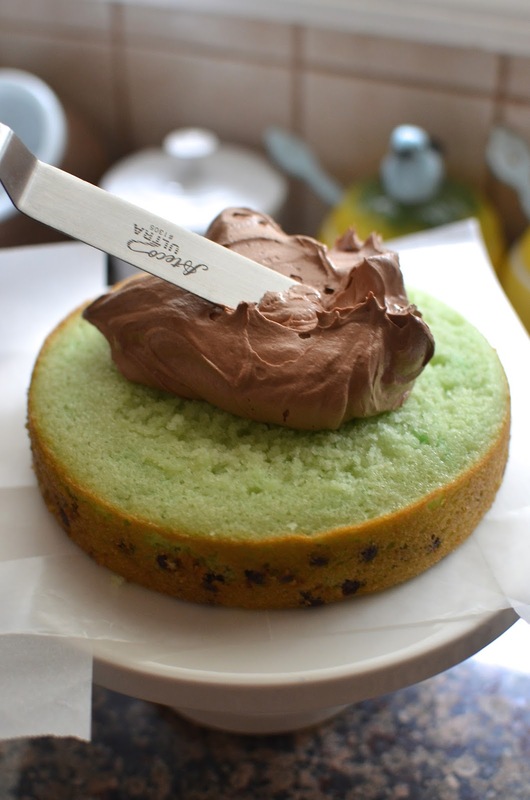 Assemble the cake: If necessary, trim the tops of the cake layers slightly to even them out. Place one layer onto a serving plate. Tuck strips of parchment paper around the bottom of the cake for easy clean-up later. Place a big dollop of frosting on top of the cake (about a half cup) and spread. Place the second cake layer (I placed the flat-side up) and spread the remaining frosting on top and around the cake. Press chocolate chips (I basically "throw" them on) around the sides of the cake. Carefully remove the parchment strips from the cake. 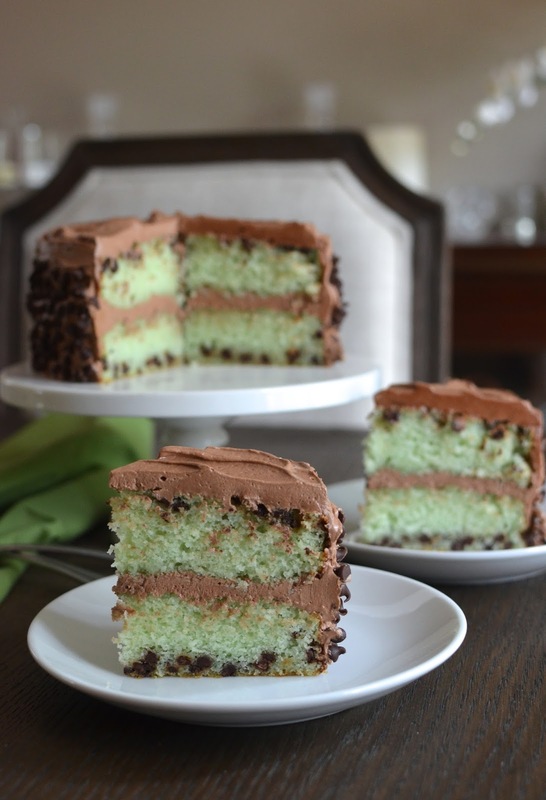 Serve and enjoy this minty, chocolaty cake! Beautiful! Lots of chocolate and that's the BEST part of this layered cake. This sounds divine and I love that it's green inside! Oh Monica, I was so surprise by the greenish cake layers in between...so cute and yes, chocolate and peppermint is a great combination. haha - yes, that is fun, isn't it?! Thanks, Juliana. You are very kind. I am actually wondering what you must be thinking with this "green" cake - compared to the intricate pastries you are used to. haha - thank you! Oh, thank you again! I appreciate it. This looks gorgeous.Love the color combo and the flavor. Wish I could grab a slice right now. You are the sweetest mom to bake a cake for back to school :) It looks delicious - chocolate and mint is always a winning choice! Haha, so cute that you started throwing the chocolate chips on the sides o the cake too - I have definitely done that before ;) Hope your son is enjoying middle school so far! Monica, this is adorable. I just want a nice big slice. Maybe two, Hahha.. Thanks so much, Bal. This is a small cake so two slices it is! I love your annual tradition of celebrating back to school. It's so nice when the children don't dread going back to their friends, and all that homework! The cake is absolutely beautiful and I bet it is delicious. You can never have too many chocolate chips and the extra on the side is perfect. I always have anxiety with cakes too - but you did a fantastic job and always do. Have a wonderful school year! Seriously that top down photo is just stunning. So perfect are the slices. Your family is so lucky to have a happy baker. You see I love to eat baked goods but I just don't like to be bothered with measuring or weighing..LOL I will just come to your house instead. Such a great tradition to start the school year. The cake looks delicious. I love mint and chocolate, one of my all time favorites. Happy Fall, Monica. This chocoalte and mint cake is a stunner. I just can’t get enough of chocolate, especially when the weather gets cooler. 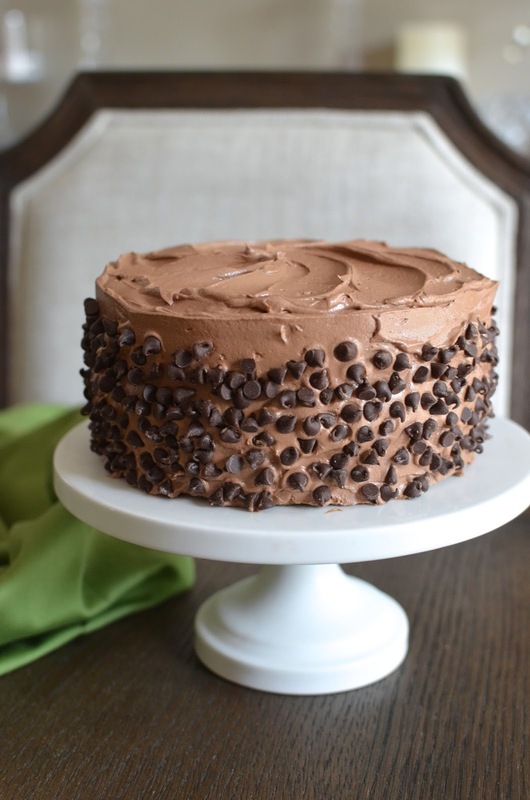 This mint chocolate chip cake looks amazing. I love that chocoalte frosting. Such a delicious treat! What an awesome way to welcome fall and new school year! Holy moly, you are a cake GOD! This looks gorgeous! Oh gosh, no! I'm not being humble when I say I'm sure you could do better than I did with this cake. : ) Glad you like it though! Thanks, Jasline. I did end up using one of the yolks but honestly, I have never frozen egg yolks. You know how the top forms this crust after a while...I've heard you need to freeze it with some liquid and I'm just not sure how to do it. If anyone does it and can offer advice, I'd love to hear it!